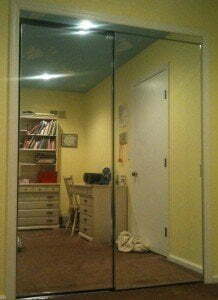 Sliding Mirrored Bypass Closet Doors add more to your room than just a way to check your outfit. The addition of the mirrored doors adds an expansive feel to the room, and brightens it by bouncing light around the room. Our top quality hardware provides a smooth, rolling motion to the door. Once your project is ready, our trustworthy, expert installers will treat your home as if it were their own and ensure that your Mirrored Bypass Closet Doors are installed correctly to last for years.